So you go and see the “Iron Man” movie and want a taste of something more. The prospect, however, of digging back through 40 years of Iron Man history doesn’t necessarily appeal to you. Matt Fraction and Salvador Larroca understand. They even have the answer. Their newest ongoing series, “The Invincible Iron Man,” is set within the current Marvel continuity, but designed specifically for new readers as well as devoted fans. A: There’s a lot of reasons. I’ve always had a fondness for the character, which is a big part of why anybody in this line of work does what they do. I always liked him because he didn’t have superpowers. The attraction to me is that it’s evolution made manifest. He’s the ultimate self-improvement project. Man rejecting his own frail, fragile biology. I love that, the guy who refuses to be a sack of meat, powerless over what happens to him. The self-made superhero is pretty great. And then, the challenges post-everything that’s been going on in the Marvel Universe lately, to call him damaged goods is perhaps even being kind. He’s so flawed, and there’s so much fun you can have right now and so much room to work. There’s so many cool stories to tell because he’s so despised and he’s in such a morally complicated space. As a writer, it’s delicious. It’s an all you can eat buffet of bathos and strife. Q: What do you bring to the Iron Man table to separate this book from the other Iron Man title? A: Well first off, my dance moves. The other Iron Man book is sort of the “24” of the Marvel Universe. It’s sort of a down and dirty espionage book. It’s Iron Man by way of Bourne, which is great. It’s an underrated, terrific book. But this is big superhero action. It’s big superhero thrills. It’s a jumping on point for those who’ve seen the movie, cause the movie is going to be awesome. It’s a place where people can come in and go “Oh, there’s Iron Man right here and right now.” The storyline is self-contained. You don’t even need to know what’s going on in the rest of the Marvel Universe necessarily. It’s Iron Man having big superhero adventures. The first storyline is him facing Iron Man 2.0. And Tony Stark 2.0 at the same time. So we’re immediately getting to the business of grinding him to pieces. Q: Can you give me a sense of the story arc and where you want to take the character? A: I really feel that he’s on a redemption arc. The table he chose to sit at requires a lot of moral compromises and so I’m looking forward to have him scroll up. As a character, he is his own worst enemy. He’s his own Doctor Doom, his own Joker. Now it’s time for him to face that. The first two arcs and beyond are really breaking him down to his most basic components. He’s facing threats on a scale he can barely imagine and we’re just gong to see what’s left. When you take away all of the comforts and all of the confidence, what happens when you strip him down to his most basic humanity, and his most basic super-humanity, if that makes any sense. What happens when he’s backed into a corner. It’s very much sink or swim. And by sink I mean die and by swim I mean live. Q: What do you think are the challenges in dealing with the character? Are there any traps you have to avoid? A: Any time you get mired down in 40 years of continuity, that’s bad news. Especially with something like the movie coming out. I knew the movie was going to be huge the minute my dad saw the trailer and asked if he could see it again. When you make it feel like “you have to know this, you have to know that.” You make the character feel old. To me, he exists as this intersection of Chuck Yeager and James Bond. No disrespect to the people who have put their creative lifeblood in the book, but when he’s just a dude in a suit punching other dudes in suits, it’s no different than any other book. But what his heart and soul is to me is he’s a pioneer, he’s a futurist. He’s a test pilot. He’s an adrenaline junkie. Whatever the future is? He’s going to get there first. He’s the Chuck Yeager who designs the plane. He’s that guy. That personal spirit of adventure and discovery, and insatiable curiosity and intellect. When you disconnect the character from his humanity and his real soul, and you just make it about a guy who looks like a robot punching other guys who look like robots, that’s pretty boring. The key is to always remind us this is a man who is on the absolute vanguard of human accomplishment and is trying to bring us all into a perfectly imagined future. Q: It sounds like you’re going to be drawing on a lot on recent events in the Marvel Universe, the whole issue of Civil War? Are you going to be drawing on any of the plot threads from the Order or other books? A: If you’ve been reading Marvel comics for the last little bit, you’ll definitely see where we’re coming from. But if you haven’t that’s fine too. It’s designed as an accessible jumping on point for people who have seen the movie. If you’ve never read an Iron Man comic in your life, this is designed to be a starting point. It’s not continuity rich, you don’t need to know 80 years of history. I didn’t know Iron Man was coming when I was writing the Order, but I knew who the bad guy was. I always knew where I was going. Iron Man came about as I was getting toward the end of the Order, so it was this, “Oh, I can just tie this in.” If you’ve been reading the Order, you are getting a little prequel to the Iron Man series. 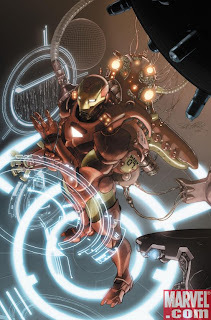 It’s one of things where I’m thanking people for following the Order and jumping on the new Iron Man series. Q: Can you talk about the importance of acclimating new readers? There is the common criticism, especially when a big movie comes out, that the big publishers don’t do enough to bring people into the comic shops. A: What’s important is to not talk exclusively to the guys like me who pick up their comics on Wednesday morning. We’re here, we’re on the team. You don’t need to pander to us anymore. The direct market, that’s where you lose it when you talk to the guys who are already buying the book exclusively. Stan Lee used to say that every comic is somebody’s first comic. And so if you notice in Marvel comics, somebody always says someone’s name around the time they first show up in the issue. You might not know who Luke Cage or Tony Stark is. Make it rich for the guys like you who are going to pick it up Wednesday morning, but then make it something for someone like my dad who sees the Iron Man trailer and is like "Oh, I can’t wait to go see that." Write the comic for your dad too. They’re not mutually exclusive propositions, you just have to know what you’re doing. The Ultimate Spider-Man book came out the same time the first Spider-Man film came out and that’s a perfect example of how to do it. There’s enough going on to satisfy the red meat comics crowd, but it’s a totally accessible jumping on point that celebrates all the parts of the myth but doesn’t require any foreknowledge of it. As a nerd I have to not write for my fellow nerds. That’s the challenge. Q: Of course, that’s been the great criticism of superhero comics, that they’re too insular. A: Exactly, and this is not that. Everything is explained. One of the finest superhero comics of the last few years is All Star Superman and he reduces Superman’s origin to eight words. It’s all possible. With a mind for clarity, it’s easy to do. Stop pandering to the people who are already on the team. A: Yeah. It’s hard to answer that question without insulting comic shops! I don’t mean to sound glib, but a $180 million blockbuster is pretty good step. It’s advertised everywhere. But really you’re talking about how to get people into comic shops and that falls under the realm of shop and store owners not being The Android’s Dungeon from the Simpsons. There’s a reason why that’s funny. There’s a reason why that’s a cliche, because it’s true. As creators all we can do is remember that each comic is somebody’s first comic, especially when it’s this kind of media opportunity. All we can do is put all the tools out there and make sure when you go to 7-11 there’s an Iron Man slurpee cup. You go to Target, there’s Iron Man bedsheets. The thing that’s interesting is you’re seeing the book trade really exploding for superhero comics right now too. Publishers are realizing when you have to rely on The Android’s Dungeon, you’re going to be let down. All I can do is write the best, most satisfying comic out there, especially when the cover price is going to be $3. That’s diminishing returns these days. Manga is 80 pages for $10-$15. All I can do is write the best book I can and see that it’s being written for everybody that might read it. Whether they’ve been reading Iron Man since they were nine years old or not. Each step in the supply chain has its own responsibilities. There’s a store in my home town that has cut outs from the first Spider Man movie, and they were still in the window when the third spider man movie came out. Yellowed and nasty and curled. Who in their right mind would go into that store? Putting those places out of business is the first thing. Q: Getting off of Iron Man for a minute, I saw where you and Ed Brubaker are leaving Iron Fist. Why? A: It was time. I think we were at the top of our personal game. Both of us had gotten pretty busy. Rather than stick around past the point of being any good, why not go out on top? I had taken on a lot of work, Ed was busy to begin with which was why they wanted a co-writer in the first place, it was time to move on. There’s something about leaving after London Calling rather than Combat Rock that’s very appealing. Q: When I talked to you last year, you were one of the rising stars at Marvel. Now, especially with Iron Fist, you’re one of a small handful of writers whose books hit that critically acclaimed list. One of the few superhero writers who’ve reached a certain amount of critical cache. What are you doing right? A: Well again, I think it goes back to the dance moves. That’s very kind of you to say. I’m just trying to write the kind of comics I’d want to read. I’ve been reading them my whole life and I’m just trying to write the kind of stuff that I’d like to read. That’s all you can do. There are guys who obsess over sales charts. I can’t handle that stuff. The only thing in my power is to write hard. Q: Where do you see your career right now? A: I’m feel like I’m on the rung of brand-new ladder. I feel like I’ve passed the establishing yourself phase. Now all I can do is try to deliver and earn the place at the table that I’ve weaseled into. Q: Apart from Iron Man what else are you working on now? A: Uncanny X-Men starting with No. 500 with Ed. Still doing Punisher War Journal with Rick Remender, which is a blast, pardon the pun. Casanova. There’s a Lincoln graphic novel I’m working on. Then there’s a Thor mini and some smaller work for hire stuff at Marvel. Mini-series and stuff like that. I just came off a year and a half of doing three ongoing and when cool, little things would pop up, there’s a Silver Surfer mini-series I had to turn down that I still beat myself up over. I’m looking forward to committing to two real long-term things and having a little bit of wiggle room where I can take on shorter term fun projects. This Thor things is a perfect example, it’s just three issues. They’ll collect nicely into a book and then I can move onto something else. Q: A point of comparison between you, Ed Brubaker and Brian Bendis is that you all keep a foot in creator-owned work. How important is it for you to be able to maintain that? A: It’s crucial. It’s critical. The work-for-hire stuff pays for me to do the creator-owned stuff. I make no money on it. Not to reduce it to such vulgar matters as money but the difference between Brian, Ed and me is that Brian and Ed make money on their independent stuff and I don’t. They can afford to pay their artists and I can’t, relatively speaking. With Casanova everything has gone to the artist and the artist hasn’t even made a living page rate. That’s another thing I hope being on this new tier at Marvel will bring some attention to the creator owned stuff that maybe store owners wouldn’t have paid attention to before. All the work for hire stuff pays for me to do that. That stuff is the bedrock of my personal audience, especially amongst editors. Maybe not every editor in the world reads Casanova, but almost every other editor does, which is huge. Q: You’re a dad now. Congratulations. A: I am totally a dad. You would not believe how much of a dad I am. Q: How has being a father affected your perspective on your work? A: I don’t know that I can address that, because I don’t know that it’s sunk in yet. It’s removed a lot of the luxury of preciousness. The closer we got to the baby’s arrival, my wife and I started hunter-gatherer mode and took on way too much work than we could handle. Suddenly it’s "The little man needs food! Must have food for baby!" It robs you of the luxury of being able to spend a day considering between camera one and camera two. Every 28 days the book’s gotta go. I’ve actually become more productive since he’s shown up and also I think being happy makes it a lot easier to work. Just being happy and the little man makes everything funnier that’s for sure. It takes away — I can’t spend a day choosing a panel transition anymore. I’ve got to do 3-4 pages a day every day or everything falls apart. Q: I was wondering if lack of sleep might have been an issue. A: You know, it’s funny. There’s actually an issue of Punisher I don’t remember writing, which is embarrassing to say. It was written the week after he came home. We were really lucky in terms of baby experiences, but that the most sleepless week I had. It was weird. Maybe that’s the secret. Sleep deprivation. Iron Man is one of my favorite character in Marvel, he's the hero but you can see all his flaws his alcoholism and how he sometimes gives things for granted, He is the ultimate story of self revival. Graphic Lit: Marvel's "Secret Invasion"